Are you a Customer Success superhero looking for a more affordable Intercom alternative? Perhaps a Sales&Marketing executive at an E-commerce business or a SaaS Founder in need of a reliable customer communication/support platform? Then you’ve probably tested, used or at least heard about Intercom software. It’s an amazing customer platform that enables thousands of online businesses to communicate with and support their customers in many different ways. Why do so many businesses love using Intercom? But, like any other product, Intercom is not perfect for everyone. There are things that thousands of Intercom’s existing and potential users are missing or having major problems with. That’s why they start looking for more suitable alternatives to it. It’s worth to mention yet another Intercom prices increase which became a huge topic for discussion in the last months. 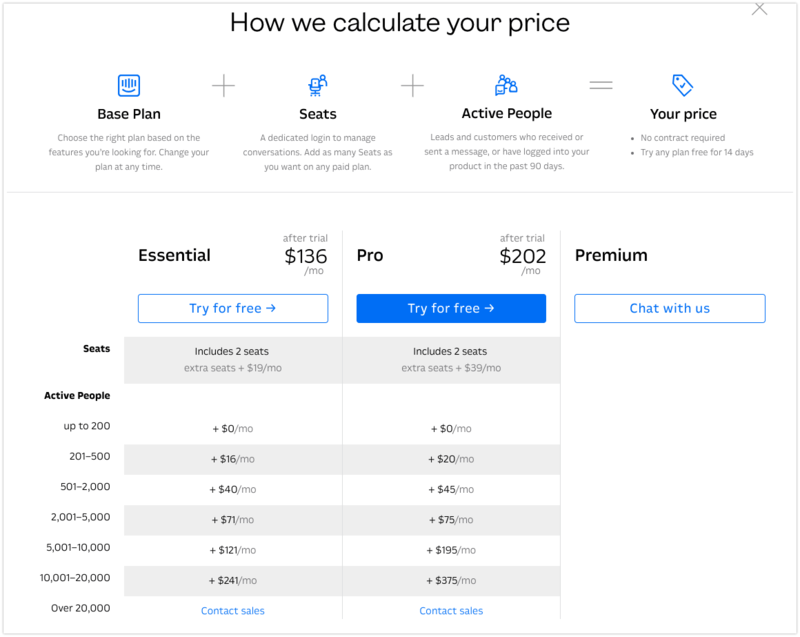 The new pricing rolled out in Oct 2018 for all new Intercom users. It will also be affecting existing Intercom customers in late 2018/early 2019. All of Intercom (Messages+Inbox+Articles); Intercom Acquire (Messages+Inbox); Intercom Engage (Messages); Support (Inbox+Articles). Current Intercom customers can view their new “estimated” bill in the billing section of their accounts. Most users say that they will experience a 50-300% increase in Intercom costs. This fact calls for a greater demand for cheaper Intercom alternatives. 30+ solutions are Intercom competitors. Or are they? 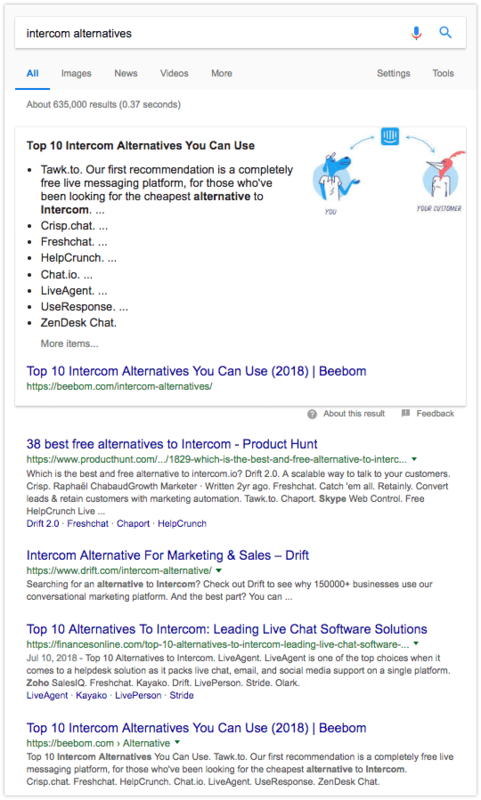 If you google Intercom alternatives, it will return lists of dozens of them. There are also free Intercom alternatives for WordPress to be found if that is what you’re after. 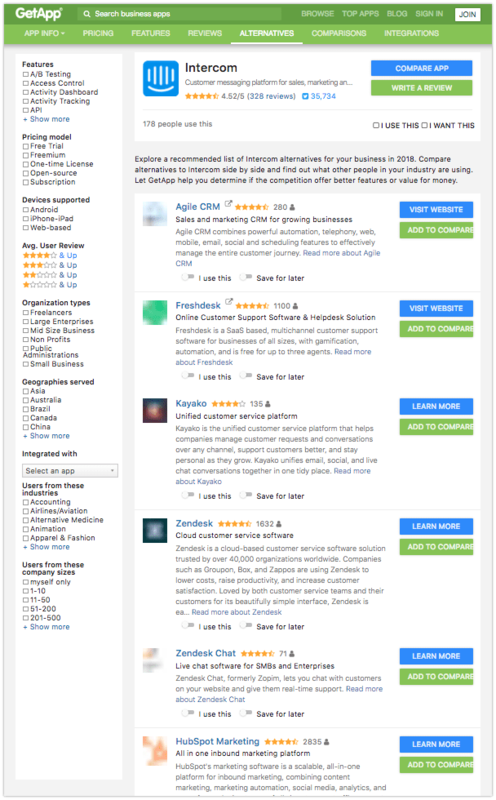 The thing is, many of those are indirect Intercom competitors – you can find a lot of corporate CRMs there, live chats without auto messages functionality, a number of help desk software solutions built solely for customer service, etc. But those are definitely not good solutions for most people that are looking for best alternatives to Intercom to cover their current needs in full. People in business are using Intercom software to Acquire, Engage, and Support their customers. And if you’re looking to do all this, there are not that many other options to consider. When talking to current or past Intercom users, we noticed that whenever thinking about switching to one of the alternatives, those people mostly consider the pricing and features differences, so we will pay the most attention to those factors. HelpCrunch, Drift, Olark, Zendesk, and LiveAgent. We do not claim that this list is exhaustive and be sure we will update it with more alternatives in the near future. We’ve tested every solution listed above for at least 2 weeks. That gave us a pretty good understanding of how each software may satisfy a typical Intercom user’s need. Without any further ado, let’s get started with the review of 5 Intercom alternatives. 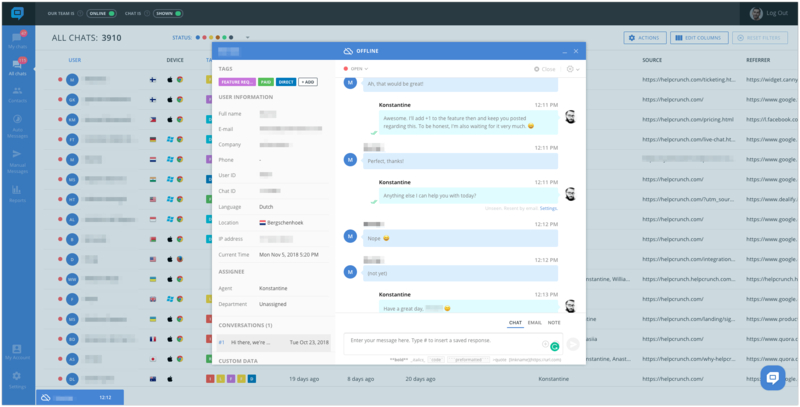 Back in 2014 while working on another project our team was struggling to find a great all-in-one customer communication software. We used lots of disconnected tools, then switched to Intercom, but it had several major flaws we couldn’t just get over. That’s why at some point we decided to build a new all-in-one solution for users just like ourselves. This is how HelpCrunch’s story began – with an idea to create a better and more affordable customer platform for small & medium businesses and startups, mostly. Today, enterprises with 10+ support agents also start using HelpCrunch more often. Organize and prioritize your customer base with ticketing functionality. The whole installation process of HelpCrunch’s live chat widget for your website/product takes about 2 minutes. Thanks to a rich set of customization options, you can make it fit your brand style as precisely as needed. From localizing chat widget for different markets to customizing widget size & color, and changing button style and wallpapers – it’s easy to make it truly yours. After logging in, you see all your chat conversations and their statuses in a single dashboard (no matter if they came through a live chat widget on your website or to your support mailbox). Connecting your product to HelpCrunch allows you to also send targeted in-app and email messages to your users based on custom product attributes. Also, in HelpCrunch you can automatically send email follow-ups if your chat messages remain unseen for a particular amount of time. This helps a lot in engaging your customers better and increasing retention. At HelpCrunch we’re obsessed about customer success. What you may immediately notice is that HelpCrunch provides a personal onboarding assistant to each user. So if any questions during the onboarding process arise, you can always count on the dedicated person to walk you through the whole journey and answer any other questions down the road. HelpCrunch offers 2 fundamental pricing packages: Live chat and Live chat & Emails. Live chat package already includes the Live chat functionality itself, as well as Auto Messages and chat Ticketing features. Live chat packages already include the Live chat functionality itself, as well as Auto Messages and chat Ticketing features. HelpCrunch pricing depends on the number of agents you need. You get unlimited chats and contacts on all paid plans. You can also install the same live chat widget on any number of domains you want. What’s unique about HelpCrunch compared to other Intercom alternatives? HelpCrunch and Intercom are pretty similar products, especially when it comes to the Messages functionality. Let’s start the comparison from the beginning i.e. onboarding experience. Intercom was really easy to install and set up. Their onboarding is the best in class walking you step-by-step through an installation checklist. HelpCrunch’s installation wizard is pretty straightforward, too. HelpCrunch also provides a personal onboarding assistant to each user to help with any questions during onboarding or later on. One of the most interesting setup steps to test was importing data. Users often want to see how easy it would be to migrate from one software to another. I tried importing contacts from Intercom to HelpCrunch and vice-a-versa – there were absolutely no issues in both instances. After uploading your contacts, you may want to bulk edit them which is possible on HelpCrunch, but not on Intercom. HelpCrunch also allows you to customize your live chat widget in many more ways like changing button styles, tabs, and more. Widget unbranding is available on HelpCrunch’s Premium (mid-tier) and Intercom’s Premium (high-tier) packages. User experience is very pleasant on both platforms. What amazed me most about Intercom is a very well thought-out user experience that walks you through every step of an action e.g. when setting up a new auto message and previewing how it would look like when live on your website. There are some great features in Intercom software that would be particularly useful for large and multinational organizations like multiple languages localizations for the chat widget, assignment rules, pre-chat forms, and more. But keep in mind that to enable these features you need to be on the Intercom Pro plan. HelpCrunch offers most of those in its Basic plan. This allows you to automatically follow-up via email if a visitor/user doesn’t see your message or leaves your website after a set amount of time. 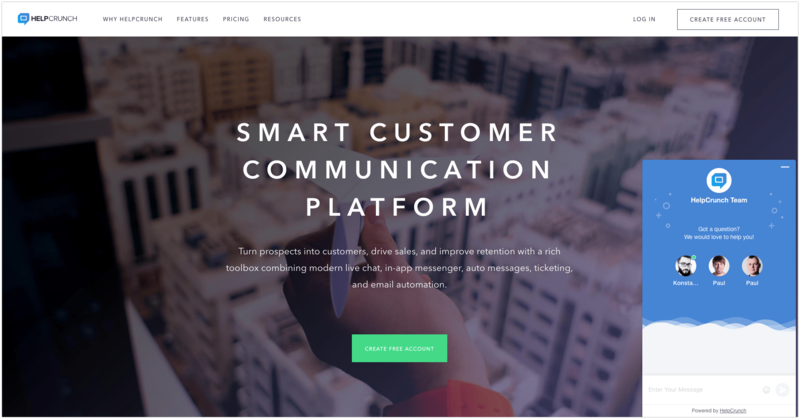 In addition to all this, as one of the leaders on the customer communication software market, Intercom already went beyond standard customer communication features and offers advanced customer support and engagement functionality like chatbot (Operator) and knowledge base (Articles). Note: HelpCrunch’s chatbot and knowledge base features are soon to be released in late 2018/early 2019. When it comes to customer support, Intercom’s agents were relatively quick to respond – as a trial user, I got a helpful answer to a first standard question within 20 minutes, to the second one – in 40 minutes. That’s an average result considering Intercom offers 24/7 support. Most visitors and users nowadays expect a live chat answer within the first 2-3 minutes. Reports say, providing a quick and helpful answer dramatically affects your conversion rates. HelpCrunch assigns a personal assistant to every user to allow for a minimum time response. Speaking of the customer support and sales results, both HelpCrunch and Intercom offer a reporting functionality to see how your agents are performing. Keep in mind that conversation ratings in Intercom are only available in the Pro plan. Unlike Intercom, HelpCrunch has a free plan that is suitable for small businesses and startups with up to 500 contacts. Both platforms offer a 14-day free trial on every plan, however, with Intercom you have to provide your credit card details to start the trial. The least expensive Intercom Engage (Messenger) plan starts at $49/mo. All of Intercom plans start from $136/mo (Essential) and $202/mo (Pro). The main issue about Intercom that lots of its users keep reporting is that their prices increase too frequently and billing skyrockets with your user base growth. In contrast, on HelpCrunch you get an unlimited number of contacts on any paid plan. Basic $12/mo plan includes live chat, auto messages, and simple chat ticketing functionality. All-in-one Live chat & email plans start at $25/mo adding emails and familiar mailbox ticketing to your toolset. Compared to Intercom, HelpCrunch offers 3-5 times cheaper options, more features in the Basic plan, and more scalable ‘per agent’ billing. Also, it allows to customize your live chat widget in more ways and provides a personal customer support assistant to each user. In addition, there are multiple HelpCrunch features related to multi-channel conversations and bulk contact editing that can’t be found in Intercom. 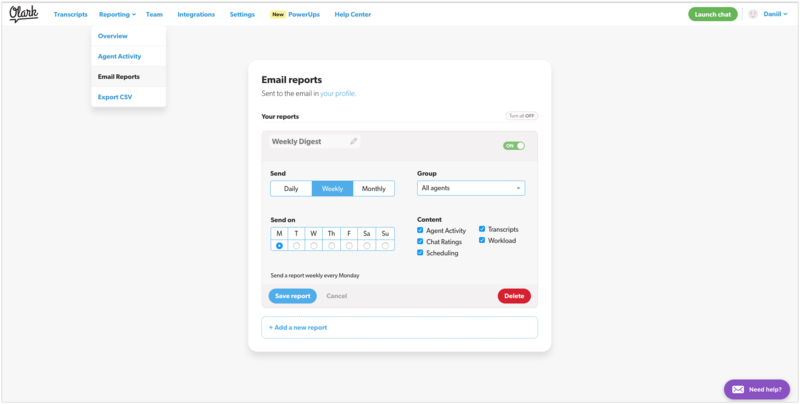 Contrary to HelpCrunch, Intercom truly shines in the Extensive feature set category with its Operator and Articles functionality already available, and has an advantage in more thought out onboarding and user experience. To sum up the comparison between Intercom and HelpCrunch, both products are rather similar and offer a familiar customer communication experience. They are especially great for SaaS and E-commerce companies that want to send targeted messages to their customers based on various attributes. Intercom is an amazing solution for large organizations with big budgets that need a robust toolset of customer support tools. In contrast, HelpCrunch is a better choice if you’re looking for a more affordable yet very similar alternative to Intercom without overspending and compromising on quality. Compare all features and pricing in side-by-side HelpCrunch vs Intercom comparison. Zendesk is a mature customer support platform that offers a wide range of features. What immediately distinguishes Zendesk apart from other Intercom competitors is that it offers a 30-day free trial instead of 14 days on the rest of the platforms. The onboarding process lasts a bit too long to set up everything, but it was still smooth. It was easy to follow the instructions starting with support email configuration to customizing the look of your Help Center i.e. knowledge base to basic Chat setting and Talk feature demo. Customizing Zendesk’s chat widget didn’t take much time, but that’s rather a disadvantage as there are practically very few customization options if you want to make it look nicer and more suitable for your unique brand and website style. Ticketing functionality is the essence of the Zendesk software. It works like a charm and has some advanced options under the hood that large teams will appreciate. Zendesk’s Guide is feature-rich allowing you to create new articles, posts, sections, and categories in your knowledge base. All in all, every functionality that we tested worked fast and smooth. It feels like you get a very reliable piece of software that won’t let you down even if the UX/UI is not the best in class. Every time I messaged Zendesk’s support team, they were really helpful and also upfront about benefits and/or limitations of the software. But the greatest thing about their support team is that they responded within first 2 minutes every single time I messaged them. That’s very fast and probably the thing I loved the most about Zendesk during my time testing the software. Zendesk pricing plans are a bit overwhelming at first glance. That’s understandable as the platform is pretty mature and offers a very extensive set of functionalities. But once you come to understand it, you can definitely pick a plan to suit you as the pricing scales with your organization size, and thus your needs. The free version is available for almost every piece of Zendesk functionality, including Guide, Chat, and Talk, but separately – meaning, you can’t use a combination of solutions for free. This scenario may only work for a small business that only needs a chat, call center software or a knowledge base. You can take the whole Suite of Zendesk features for a test trial. After the 30-day period is over, The Zendesk Suite pricing starts at $109 a month on Professional and $179 a month on Enterprise plan. The professional plan doesn’t include chat unbranding, customization options, roles and permissions, and other things that come with the Enterprise plan only. What’s unique about Zendesk compared to other Intercom alternatives? 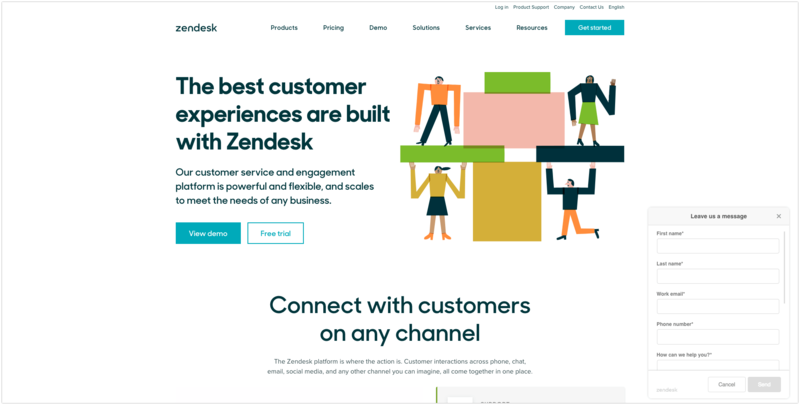 You can immediately tell the difference in the positioning of two platforms – the first thing Zendesk offered to configure once you log in is to get your support mailbox set up. Intercom, on the other hand, offers to configure your live chat widget first. Zendesk started as a helpdesk/ticketing platform back in 2007. The primary functionality was organizing your support inbox and converting every email into a ticket for your support team to take further actions on. Only a couple of years ago Zendesk introduced their live chat software (Zendesk Chat) to the suite of customer service tools after acquiring Zopim live chat. Kind of. Because you can still see that Zendesk Chat is not 100% integrated into the whole toolset which may cause some minor issues and inconveniences here and there. When it comes customization, Intercom definitely offers many more options which also just look more modern. There is definitely a steep learning curve to Zendesk. You’re going to invest more time compared to Intercom into browsing through and figuring out how every feature works separately and in combination with other features. Zendesk’s UI (and also UX from time to time) do not feel as being up to 2018-ish standards like Intercom’s do. Although Intercom is not a year old baby either, it managed to constantly keep the innovation bar high for the UX/UI of their product suite and that’s what you can see from day one of testing both solutions. Zendesk doesn’t feel as modern as it could be both for customer and agent side. I found that if I wanted to work most productively I’d need to have all 4 main Zendesk products opened in different browser tabs as there is no option of having all of them within a single dashboard. That might be ok if you have many teams where each one is responsible for their separate function e.g. handling chat requests, or working with tickets, or handling phone support requests etc. But if you just have a single customer support team, it may become a bit of a mess. 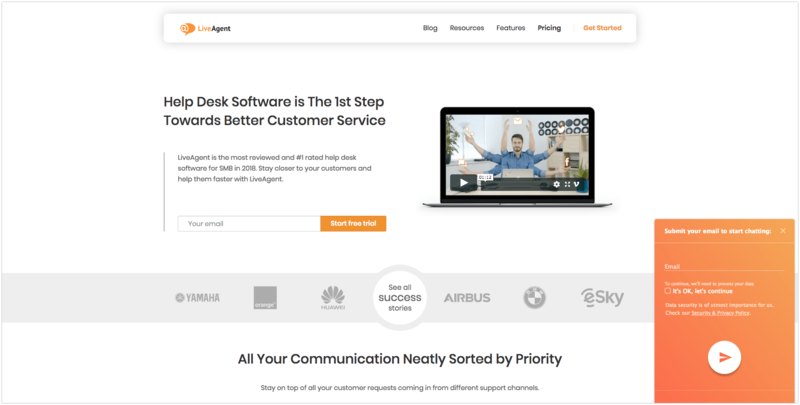 While testing it, I found Zendesk to be a more customer-service oriented product as opposed to Intercom which is great for everything from marketing and sales to customer support. 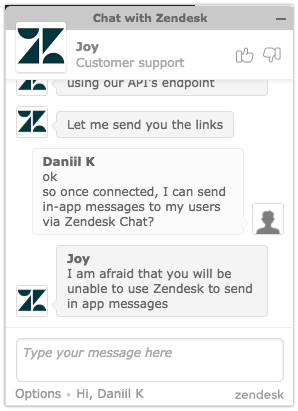 Also, if you run a SaaS company and want to send in-app messages to your users, that’s not really possible with Zendesk. To add to that, Zendesk doesn’t offer email marketing functionality which could otherwise enable you to send email campaigns to your customer base. There are some workarounds to sending targeted messages in Zendesk, but for 99% of people it’s too limited, technical, and simply not worth it. Both platforms provided great customer service during our 2-weeks trial period. Unlike Intercom though, Zendesk agents respond almost immediately which forms a better overall impression. Zendesk offers free and lower priced products when chosen separately. But to our surprise, Zendesk’s ‘All in one’ suite turned out to be more expensive than Intercom’s one. On per month basis, All-in-one Zendesk Suites are priced at $109 (essential) and $179 (enterprise) per seat. For comparison, with All of Intercom, you pay $136 and $202 with 2 seats included. If you purchase at least two seats, Zendesk plans actually turn out to be more expensive. However, Intercom only includes up to 200 active people in those pricing tags while Zendesk includes unlimited contacts on their All-in-one plan. Let’s take an example of an imaginary company with 5 seats and 10,000 contacts. For such organization, the full suite enterprise plan on Zendesk will be priced at $895 vs $694 on Intercom. However, keep in mind that Intercom also has a Premium plan with more functionality, but the pricing for it is not disclosed on their website. Both Zendesk and Intercom are great solutions for medium and large organizations – but for different types of them. Zendesk is a more compelling solution for large established organizations that have a number of single-function teams responsible for their respective tasks (like customer support/ticketing agents, live chat agents, call center agents, knowledge base owners etc.). Zendesk won’t be the best choiсe for SaaS or e-commerce projects though as it lacks in-app messaging & email marketing features. Intercom is definitely more suitable for fast technology companies that need an all-in-one (marketing, sales, support) solution and have a budget big enough to not mind Intercom’s high and ever-changing pricing. If you’re not a SaaS or e-commerce company and you handle a large number of contacts and support tickets with a relatively low number of customer support agents, you’ll be better off with Zendesk. It’s quite hard to make the switch from All of Intercom’s suite to Zendesk’s All-in-one suite since Zendesk doesn’t have some useful marketing & sales functionality. The same is true for switching from Zendesk to Intercom – you may find yourself missing on call center and other functionality. It all comes down to your needs, but if fully-packed suites are not what you’re after, Zendesk might be a more valuable option for small businesses that only need a single feature (beware of the limitations on those plans though). Drift takes a bit different approach to customer communication focusing on bot conversations for lead qualification. Firstly, I wanted to quickly chat with Drift’s agents to see how quickly I can get a real human to talk to me. I tried to ignore the initial bot answers and asked pricing related questions. The agent started asking qualifying questions to better understand my needs and how Drift can help me cover them. That’s what Drift is all about: qualifying your visitors with bots and allowing your human agents to close the deal in the conversational marketing manner. I wasn’t able to test all that Drift has to offer since the free trial for their Standard and Pro accounts is not available. Drift explains that by stating that they assign a customer success manager to help you with Bot playbooks (that are available for Pro account users only). Immediately after signing up for a Free account you get to customize your live chat widget as the first onboarding step. Only after that, you go about installing Drift on your website. The installation and onboarding process went smooth and didn’t take more than 5 minutes. Drift offers a few neat customization options in the Free tier, but to unlock Drift branding removal and else you need to upgrade to the Pro plan. What’s great about Drift is that its Knowledge base (Drift Help) is already included in the Free plan. You can create an unlimited amount of articles for your leads to refer to when they have any questions. Even though you can send outbound emails with Drift, the solution provider itself is not the best performer of this task, apparently. 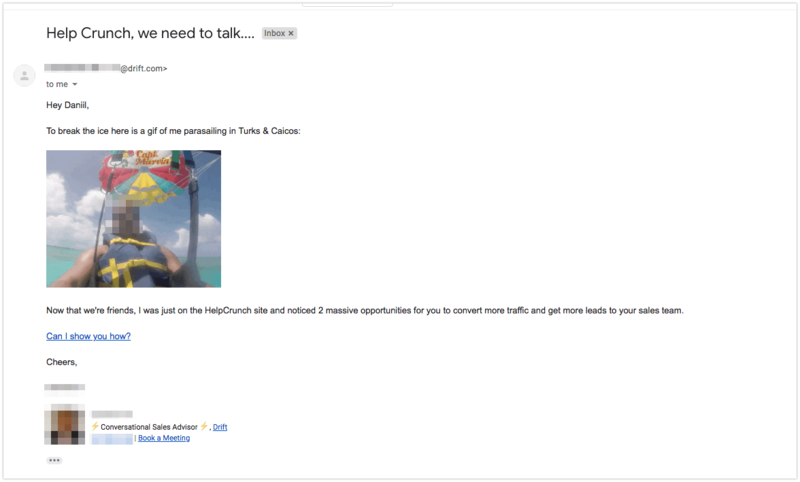 I let you be the judge on the message itself, but from what I heard targeting your competitors is not the best sales strategy. The thing I really liked about Drift before signing up turned out to not be as great after you try out the Free account. I asked a question which the bot couldn’t answer and requested a human to answer instead. One hour later, I received a clarification question from Drift’s customer support agent and after a quick response from my side, I found myself waiting for the answer from Drift answer for around 12 hours which is the slowest response in our test. The free plan is great offering rich functionality, however, the number of contacts included is very small (100). On paid plans, the billing gets pretty aggressive forcing you to pay extra $10 for every 1,000 contacts which is not good news if you’re a B2C SaaS or e-commerce businesses beyond early stage. What’s unique about Drift compared to other Intercom alternatives? Drift is frequently seen as one of the main Intercom competitors. Both companies are pretty well known, especially on the US market investing a lot in their respective promotional campaigns. 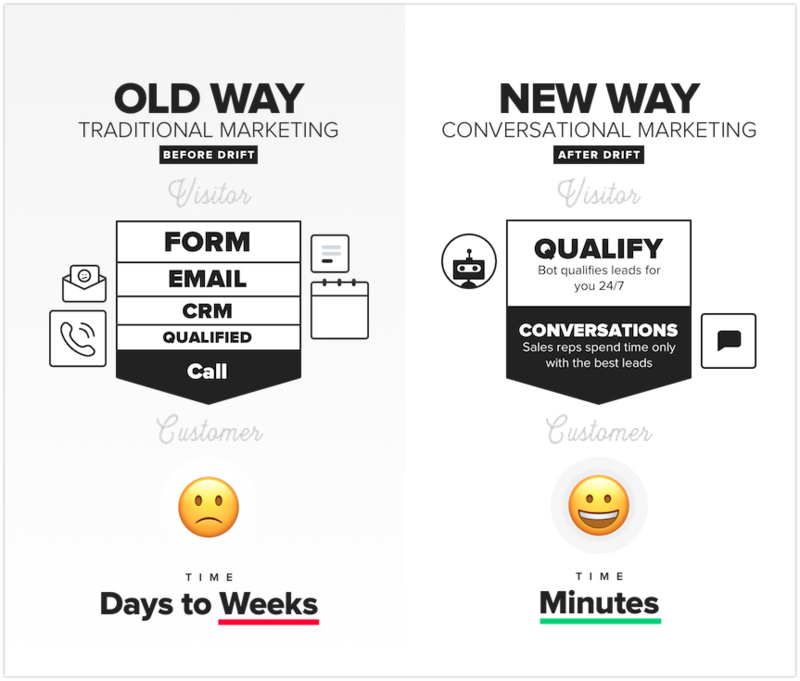 Drift heavily focuses on the ‘Conversational marketing’ notion as the main driver of their platform. It is quick and easy to set up both platforms’ live chat widgets to work on your website. Intercom offers a bit more customization options compared to Drift. Also, keep in mind that branding removal is only available on the most expensive plans of Intercom and Drift. 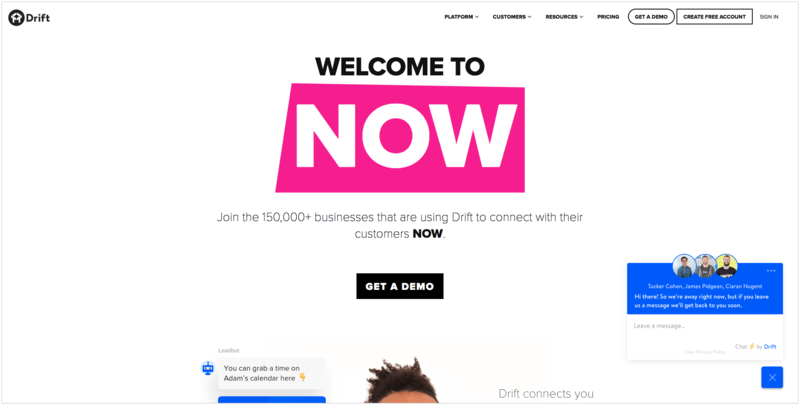 When you hear about Drift you probably imagine chatbots & more sales. But that’s not exactly the reality you experience when using the platform (especially if you have the Free account). Good, because there’s much more to the Free plan than you expect at first – with all kinds of emails functionality, fully-featured and unlimited Help articles, and more (keep in mind the 100 contacts limitation though). Bad, because no bot functionality is available in the Free or even Standard plan. Talk about unmet expectations. Connecting your product to the Drift platform to send in-app messages is possible starting from the Standard plan (with chat and email playbooks). Bot playbooks are available starting from the Pro plan. Unfortunately, ticketing functionality is not something Drift can offer. If you’re looking to switch from Intercom, keep in mind those missing Drift features. Drift’s customer support team was much slower to respond in our experience. You can find yourself waiting for a response for over 12 hours once you convert to a free account. Intercom’s agents were much quicker to respond with an average response time of 20-40 minutes. Truth be told, Drift’s free plan is a great solution if you don’t have a lot of website traffic/contacts. Intercom doesn’t offer anything for free. But what if stakes are high and your pockets are full of gold? Which fully-featured plan will be ideal for you? Drift’s $500/mo Pro plan is pretty high-priced, but with that pricing tag you get 5 seats, automated meeting booking, and the famous Drift bot and assistant. The only little downside – there are only 1,000 contacts included. You pay $10/mo extra for every 1,000 contacts which is not a lot, to be frank. With 10,000 active people, All of Intercom’s Pro plan will get you at $694/mo with 5 seats. But to connect the bot (Operator) functionalities, add at least another $49-199/mo to that to arrive at the final $743-893 per month on Intercom. Which is a lot compared to Drift’s $600 per month. Both Drift and Intercom are among the best in their respective categories. Drift is definitely more suitable for sales-driven organizations with bigger checks and longer lead qualification processes & sales cycles. However, we were surprised to see that email and knowledge base functionality is included in Drift’s free plan which makes it a great solution for small companies that only need one seat and don’t manage many contacts. Ask yourself twice – do you really need a bot for your business? If not, Drift’s Free and Standard ($50) plans are pretty great deals for small non-product based businesses that also don’t require ticketing. If yes, the answer is the same – Drift, but go with the Pro plan. Service agencies, as well as other B2B organizations targeting enterprise and mid-size businesses are the ones who’ll be really satisfied with Drift’s platform. SaaS and e-commerce businesses with smaller average checks would be better off looking at Intercom’s solution. Just like Zendesk, LiveAgent was founded back in 2007. And interestingly, it also started as a ticketing system aiming to develop an all-in-one helpdesk software. The ticketing roots have grown into the LiveAgent software so deeply that the primary package that it offers is the ticketing one. It was easy to get started with LiveAgent following a simple onboarding checklist. You get a support mailbox set up right away and proceed to learning the basics of how to use the software. However, the first problems come after installing the LiveAgent’s live chat widget. It doesn’t look nearly as good as other alternatives to Intercom and the customization options are rather poor. The way the incoming chats are implemented is also not up to today’s standards. When your visitor simply clicks on LiveAgent’s chat widget on your website (without sending a message or even typing anything), the system automatically notifies your support agent about a potential chat and connects him to a chat conversation with the visitor. This way, your support agents may end up wasting a lot of time on prospects who are just randomly pressing the chat button without necessarily willing to start a conversation. Not only the looks, but you face various user experience issues once you get to use LiveAgent more. UX/UI of the whole platform is just plain old (morally and technically) both for the customer and admin side and that’s the biggest downside of LiveAgent. However, a great thing about LiveAgent is that you have access to all the features from a single tab. With LiveAgent, you can chat with your website visitors, call them, respond to and solve tickets, create articles in the knowledge base, start a forum, and check your performance reports. LiveAgent’s reporting functionality especially comes in handy when you have a lot of customer support agents and want to track their performance. You can track each agent’s work time hours, amount of answers, resolved tickets, chat messages, and calls. When it comes to software’s performance, we didn’t experience any issues. Each functionality worked as supposed to and you can definitely rely on it for your customer support needs. Having a conversation with LiveAgent’s support was not a bad experience. The agents were quick to respond and generally helpful in answering standard questions. There may be some issues though if you require help with out of ordinary issues. There is no free version, but you can start a 14-day trial on any of the plans. What’s unique about LiveAgent compared to other Intercom alternatives? It’s easy to follow both platform’s onboarding checklist to get everything setup and ready to go. LiveAgent’s customization options are nowhere near Intercom’s ones, though, so keep that in mind. Much like Zendesk, LiveAgent is a more customer service oriented solution compared to Intercom. LiveAgent offers a cloud Call center and Forums which Intercom doesn’t have. Also, LiveAgent’s reporting functionality is more advanced. If you run a SaaS or E-commerce business though, LiveAgent’s rich functionality might not be that appealing for you. Moreover, it doesn’t offer advanced features like auto messages and manual messages which are vital for acquiring and engaging more users for a product business. Unlike LiveAgent, Intercom platform is much easier and more pleasant to use with its nearly perfect UX/UI both for you and your users. Intercom’s chat and email marketing functionalities are more suitable if you need more freedom on the sales & marketing side. Even though we think that the way LiveAgent’s notifications about new incoming messages are implemented is not really a good practice, they may allow for a quicker agent response compared to Intercom. LiveAgent’s support team was indeed a bit quicker to respond to multiple queries, but the responses themselves were not that helpful. Neither LiveAgent nor Intercom have a free tier to offer, but there is a 2 weeks trial period during which you can tak both platforms for a full test-drive. There is a drastic difference when you compare LiveAgent plans with Intercom pricing packages. The most basic LiveAgent Ticket plan costs only $9 per month. If you want it all, LiveAgent’s All-inclusive plan with 2 agents costs $78/mo (with no users limit) compared to All of Intercom’s Standard package of $136/mo and Pro package of $202/mo (with the limit of 200 users). Although not the leader in the customer support category, LiveAgent is still a good solution for price-sensitive buyers. It’s ideal if you want as many customer support features for the smallest price tag possible. However, keep in mind that chatbot, auto and manual messages via chat/emails are not present in LiveAgent, and the UX&UI is not up to modern standards. If you care about those features and how live chat widget looks on your website, Intercom is an easy pick between the two. Olark is a live chat solution for websites. 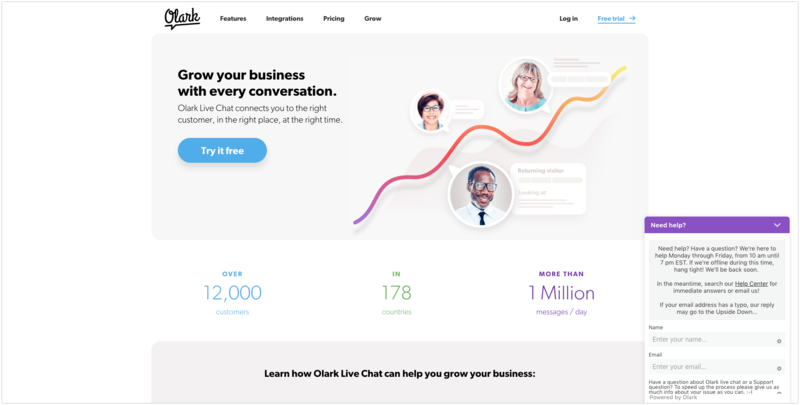 Unlike other Intercom competitors on our review list, live chat is the only big feature Olark offers. Setting Olark up was very easy. There is also a bunch of chat widget customization options. Unfortunately though, you’re not able to upload your company’s logo, change widget wallpaper, and else to make it look and feel truly yours. Targeted messages (chat auto messages only). Live chat is the only major feature Olark offers. Fortunately, it’s well-built, worked super flawlessly and reliably during our 2-weeks test period. There are lots of standard settings like shortcuts, chat ratings that let you set up Olark according to your team’s needs. If you have at least a couple of agents on your team, the reporting tab will also come in handy. With Olark’s reporting, you can see the number of chats per agent per day, your agents’ overall performance, and get a weekly performance digest delivered to your email which is neat. You can also set up offline and pre-chat forms to capture a visitor’s email and other information before allowing to proceed to chat with your team. But here is where the first user journey problem kicks in. Suppose, a visitor left his/her email in your offline form and sent you a message. A few hours later you see the visitor’s message along with the email address and other info. But in most cases, the visitor already left your website by that time and your chat response won’t likely be seen. The only thing you can do then is to go to your email service of choice and send a separate email which is not very convenient to say the least. Another workaround in that situation would be Olark’s integrations with email service providers like Mailchimp. Targeted chats (auto messages only) are available based on your user behavior. Unfortunately though, there is no way of hooking up your product to Olark so that you can send in-app messages to your registered users based on custom parameters. Although Olark’s support team is not available 24/7, they were quick to react to a registered user’s question with a helpful answer. After Ending chat, you can rate it and get the chat transcript sent to your email which might be useful for many. Free plan – basic features, 1 agent, only 20 chats/month (probably the most limited free plan we’ve ever seen after looking at 50+ live chat solutions). Premium plan is priced at $17 per agent per month. It includes unlimited chats and all premium features like reporting, shortcuts, auto messages, chat ratings, pre-chat form, as well as all integrations. To get more of your Olark experience, you can purchase add-ons called PowerUps, which are pretty interesting, but rather expensive too. What’s unique about Olark compared to other Intercom alternatives? You likely won’t experience any problems installing Olark or Intercom live chat widgets on your website. Intercom, however, offers a bit more customization options to play around with like changing wallpapers and uploading your company logo. Now when we’re clear about those, let’s focus on comparing only the live chat functionalities of both platforms. As you might expect, all the standard chat features are offered on both platforms. Allowing for integration of your product with the platform, and therefore giving you the ability to set up business-specific triggers and send automated messages to your users based on those. On the other hand, Olark can boast of offering some unique PowerUps that are hard to find in any other alternatives to Intercom like Chat translation and Visitor co-browsing. Both platforms perform really well and it’s unlikely that you will face many bugs if any during everyday’s usage. Communicating with Olark’s and Intercom’s support agent was generally a great experience. 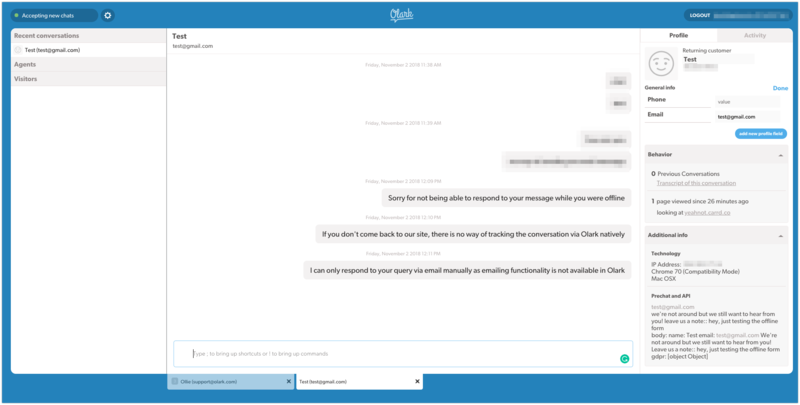 Olark doesn’t provide 24/7 support, but responds almost immediately whenever their team is online. Intercom’s support agents don’t usually respond that quickly even though they provide around the clock customer support. In contrast to Intercom, Olark offers a free plan, but it’s limited to just 20 chats a month. So pricing-wise, we compare Olark’s Premium plan and Intercom’s Engage Pro plan as there are rather similar features offered on those. Olark starts from $17/mo (with unlimited contacts) and on Intercom be ready to shell out $75/mo (with up to 200 people). Olark’s raw pricing figures definitely look more compelling, but keep in mind the limitations of Olark’s auto messages and customization options. Considering both Intercom and Olark live chats’ pros and cons, we’d recommend those platforms for different types of companies and use cases. Intercom Messenger is a much better choice for cloud product-based businesses that want to have the convenience of talking to their users inside the product itself. with a huge amount of traffic and customer base coming from all over the world. Olark’s chat translation feature might be very handy so that you don’t need to hire customer support agents from different parts of the world. with sophisticated service/product requiring long and complicated onboarding/training. Olark’s co-browsing functionality will be of huge help for your service team. 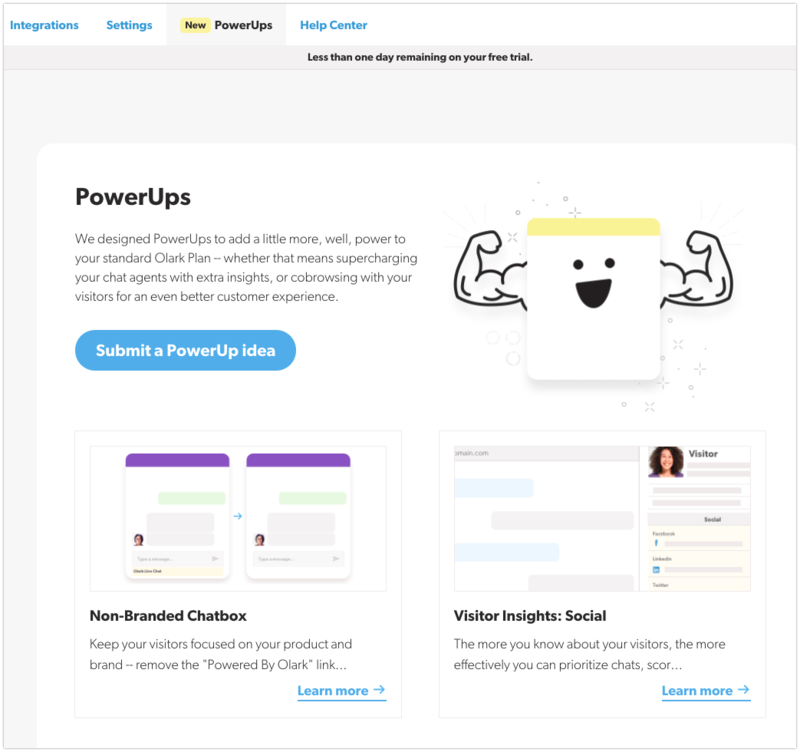 If you don’t need those features, you might look elsewhere as other Intercom competitors offer more in their live chat software plans for less. There are tons of great live chat software solutions available on the market. But when it comes to picking an Intercom alternative that does more than just live chat, you need to dig deeper. After testing 5 best Intercom alternatives, we understood that there is no ideal solution for everyone. There are cheaper Intercom alternatives on the list, and there are some Intercom competitors that would cost you even more than Intercom itself. Some of the alternatives are very similar to Intercom in terms of functionality, and the other ones offer only a small part of its functionality while shining in other aspects. Each of the solutions that we’ve reviewed has its pros & cons, and just one best solution for everyone doesn’t exist. Our Intercom alternatives rating system is, of course, subjective. The higher the score by no means implies that a particular customer communication/support software is better than the other ones. What we wanted to showcase is how well each Intercom alternative solution may suit your needs if you want to migrate from Intercom. Olark -for medium and large businesses that offer sophisticated service/products for a lot of customers all over the world. What’s your favorite Intercom alternative? Which of the two most popular help desk tools is better for you? We've compared their features, price and customer service among other things to make your choice easier. Can't decide whether your business needs Zendesk or Intercom to jumpstart your customer success process? We're tested them for you and here's what we found out.